PureFlex | 100 Series Valve, light weight, rugged, corrosion resistant valve. One piece massive valve body is light weight, rugged, and is as corrosion resistant on the outside as it is on the inside to resist environmental attack. Available in fiberglass or carbon graphite reinforced vinyl ester or E-Plus™ epoxy materials. The valve body meets ANSI B16.10 and flange connections are compliant to ASME B16.5 Class 150. 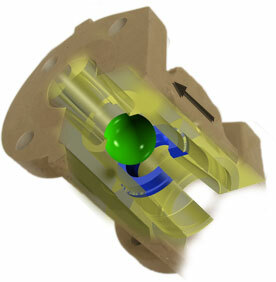 Other flange drilling options are available. Check valve ball is manufactured from virgin PTFE and is available in solid or hollow construction. The solid PTFE ball needs just over 1 psi to unseat when the valve is in the vertical position. Check Valve seat is manufactured from virgin PTFE and is designed for tight trouble-free sealing in your most demanding applications. The seat is easily field repairable with only the end cap needing removal.